The Pearl HWP-930 Hardware Pack is a heavy duty, road worthy drumset hardware combination from the top of the line 930 series. 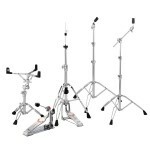 This hardware pack includes one each of the following: BC-930 boom cymbal stand, C-930 straight cymbal stand, H-930 hi hat stand, P-930 bass drum pedal and S-930 snare stand. All stands are double braced and the innovative foot pedal is extremely smooth and well engineered. This is a rugged set of hardware with a big discount! The medium weight HP6005 Hardware Pack is double braced, but not super heavy. It is ideal for travel and light club work. The pedals are very smooth and stands are stable and dependable. 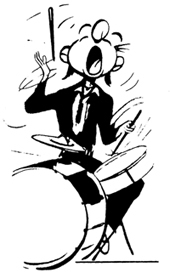 Mapex offers a five year warranty on the hardware(under normal conditions). All of the stands have slip-proof rubber feet. 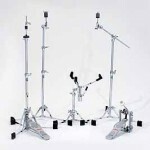 The pack consists of: 2 boom cymbal stands, bass drum pedal, snare stand, high-hat stand. 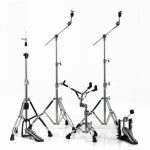 The Pearl HWP-830 Hardware Pack is a heavy duty, road worthy drumset hardware combination from the medium weight 830 series. 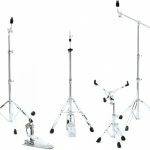 This hardware pack includes one each of the following: Boom Cymbal Stand BC 830 , Straight Cymbal Stand C-830, Hi-hat Stand H-830, Snare Stand S-830, and Bass Pedal P-930. The HWP-830 is a very reliable and durable pack featuring double braced stands. The Pearl Lifetime warranty comes with the package.